Spiders are a very common insect pest in Virginia. They are a beneficial part of the ecosystem unless they invade your home or business or are poisonous. Although all spiders use venom to kill prey there are only two spiders classified as dangerously poisonous. These would be the Black Widow (picture right) and the Brown Recluse. 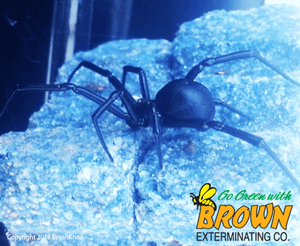 Black Widow spiders are very common in the Shenandoah Valley but Brown Recluse spiders are rarely found in this part of Virginia. Regardless of the spider most people do not want them in the house. We can keep spiders outside where they can continue to be beneficial without the worry of one walking across the kitchen floor. Call today for a free inspection. One key to keeping spiders out of your home or business is to treat the exterior of the structure so they never get in. This requires a synthetic and or natural pesticide barrier applied to the exterior of your home or office where spiders reside. We treat porch ceilings, around gaps in windows and doors. We treat under the lower edge of vinyl siding and any other gaps that are present. Yard treatments are also available. An important part of a spider control program indoors is the use of glue monitors. These are small boxes with a sticky interior that spiders will be attracted to and get stuck in. They are placed in basements, garages and other remote parts of the building with access to the outside. Glue boards are useful not only as a control measure, as any spider caught in one is a dead spider, but also as a monitoring tool to determine where hot spots are and as a long term gauge of the success of a control program. We leave these in place to be checked for the duration of a pest control program. Brown services Waynesboro, Stuarts Draft, Lyndhurst, Fishersville, Staunton, Harrisonburg and and Lexington Va as well and surrounding areas. Call today for a free inspection, 540-470-0175.